It should also be more exciting to drive thanks to G-Vectoring Control now available as standard. Mazda’s flagship CX-9 SUV has already earned a reputation for being one of the safest luxury crossovers on the market since the current model was introduced in 2016. The 2017 model earned the prestigious Top Safety Pick+ award by the Insurance Institute for Highway Safety, scoring top marks in all five crash tests. 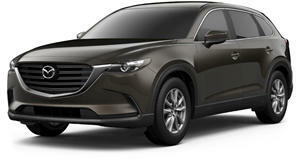 But that hasn’t stopped Mazda from continually improving the SUV’s safety. For the 2018 model, Mazda has revealed that the CX-9 will arrive with a slew of new safety tech features as standard. Due to arrive in dealers later this month, the 2018 Mazda CX-9 will come equipped with Smart City Brake Support across all models, which automatically hits the brakes in emergency situations below 19 mph. Blind Spot Monitoring and Rear Cross-Traffic Alert also now come as standard. Mazda hasn’t only focused on safety features either, as the automaker also aims to improve the CX-9’s driving experience with G-Vectoring Control which is now a standard feature. The technology tweaks the engine mapping in conjunction with steering and throttle inputs to reduce engine torque, shifting the weight to the front wheels and making the steering feel more direct. Mazda says the driver will “gain more confidence and control behind the wheel” with this technology. The CX-9 is already one of the quietest cars in its class, but Mazda promises that the CX-9 has better sound insulation, as well as an improved second-row seat that’s more comfortable and provides access to the third-row. Like last year’s model, power is provided by a turbocharged 2.5-liter engine that produces 250 hp and 310 lb-ft of torque paired with a six-speed automatic transmission. All these technology updates mean that prices for the CX-9 have increased slightly, however. The base model, for example, now starts at $33,070 compared to $32,460 for last year’s model. Opt for the new $1,290 Sport Package, and you also get automatic headlights with high-beam control, lane departure warning, lane-keep assist, rain-sensing wipers, heated front seats, a power driver’s seat, and radar adaptive cruise control. The mid-level $35,900 Touring trim, which is $1,010 cheaper than last year’s model, now includes a tilt function on the driver’s seat and a power passenger seat with lift and lumbar support, as well as leather seats and a power tailgate like before. An optional $1,890 Premium Package adds LED fog lights, navigation, a Bose 12-speaker stereo, parking sensors, and a sunroof. The $41,410 Grand Touring trim, which has no price difference over last year’s model, adds adaptive lighting, aluminum trim, and a head-up display. For the 2018 model, Mazda has added heated second-row seats, a heated steering wheel, and windshield wiper de-icer. All three models are available either in Front-Wheel Drive or All-Wheel Drive. The top-of-the-range Signature trim hasn’t received any updates other than the new standard safety tech features, and remains priced at $45,255. As before, the Signature trim adorns the interior with Auburn-colored Nappa leather, rosewood trim by premium Japanese guitar-maker Fujigen and LED signature grille and LED interior lighting.